Charles on Fatherhood in theory and practice, past and present. Father’s Day is a relatively new holiday in these United States. Deriving from diverse sources – and with a heavy boost after World War II from the menswear industry, it was not until 1972 that President Nixon signed it into law as a permanent holiday – celebrated every third Sunday in June. I must admit that we did not do much for it when I was growing up, despite, as you shall see, the way my brother and me idolised (and continue to idolise) our father. But it is as good a reason as any to comment on Fatherhood in general – commentary ever more important when gender identity itself is under attack in Church and State. It is really from the parent of the same gender that we tend to derive our understanding of what it is to be a Man or a Woman. It cannot be a coincidence that the rise to power of the first generation to be formed by the collapse of the family is also responsible for the attempt to use the power of government to inflict gender fluidity upon a hapless populace. Fathers have it tough to-day – not only are they constantly told in the media and by the minions of the regimes under which we live that Fatherhood is unnecessary for mentally healthy children, they are told that masculinity itself is irrelevant by those same unimpeachable sources. Said sources, of course, are in great part the damaged emotional goods earlier referred to: their ignorance can be forgiven, if their power cannot. But it makes a little remedial course in Fatherhood necessary, not unlike the remedial courses in basic academic skills most colleges and universities have to offer to make up for the damage the same sort of people have done to education. The Father is one of the three great masculine archetypes, alongside those of King and Priest. To begin with, the Father is one of the three great masculine archetypes, alongside those of King and Priest. It is interesting that each of these three partake to some degree of the other two. So the Priest derives his holy orders from God for the purpose of making Sacrifice and forgiving sins. But he is like the King in his authority to counsel sinners and direct the temporalities of the Church, and like the Father in the paternal care he ought to take toward the souls in his charge. The King derives his right to rule from God, and so must try to guide his people in such a way as to keep them safe and fed and in a frame-of-mind to think about their souls. But he is like the Priest in the quasi-sacramental nature of his office, and like the father in that he is the head of the national family. So too, the Father is given authority by God for the begetting and upbringing of children, and the guidance of the Family. But he resembles the Priest in that it is his right and duty to set the religious tone of the home and lead such domestic rites and prayers as custom gives him, and like the King in that God has made him leader of his small realm, and responsible for the welfare of its inhabitants. Such was the traditional theory, and I would apologise if I wished to those whom it may offend – were it not that had no better alternative, and what they have imposed has been disastrous. But let us descend from theory to experience. In this area, since I am not a father (although I am a proud Uncle with ten nephews and nieces – there is much I could say about that role, but we Uncles have no day of our own), I must beg your indulgence and reminisce a bit. Now, I do not exaggerate (and I think my older brother, Andre, would agree with me in this assertion), but my father was quite simply the greatest man I have ever met. He was at different times an actor and a writer (that part of his inheritance came to me) and a businessman and soldier (Andre got those bits). Then there were elements to his character neither of us received – he was a very talented sketch artist, and a whiz with pool and poker. On July 1, 1996, he left us behind in this Vale of Tears. One week later I was sitting in a restaurant, and Dan Fogelberg’s song, “The Leader of the Band” played – I bawled like an infant. To this day I cannot get through that tune dry-eyed. But other than natural filial devotion, what was it that made Dad so great in our eyes? For starters, he made it very clear, in a thousand ways, that he loved us and that we were his reason for being, and his major interest – he had many lesser ones, of which more in a moment. Dad made a point of encouraging us to explore our interests, and identify our personal strengths and weaknesses: to develop the further, and eliminate, control, or compensate for the latter. He did not play favourites, and strove to see that each of us received as much time from his as possible – hence, at least once a week both us would have “private time” with him, in the course of which we might chat with him about anything we chose. At early ages, he taught both of us to use the Library, and whenever we developed enthusiasms – be it astronomy, bee-keeping, or whatever, he saw to it that we got as much information as that pre-internet age could offer. He was keenly interested in everything we did – to include Scouting; without his encouragement (and occasional pushing) I doubt either of us would have gotten our Eagles. Dad was interested in any number of things. He did not graduate from New Bedford High, going into the Army Air Corps (and a tail-gun seat in bombers over Japan) on his 18 th birthday, and his college education was limited to post-War attendance at the American Academy of Dramatic Arts on the GI Bill. He was a complete autodidact, though, with an endless thirst for knowledge – “when you stop learning, you’re dead!” was one of his constant refrains. I can honestly say that almost every single one of my varied intellectual enthusiasms, I got from him – and I suspect that if he were alive to-day he would ruin his health by attempting to stay awake for 24 hours absorbing all the internet can teach the discerning student. He was devout – partly from his Catholic upbringing, and partly from his experiences during the War. 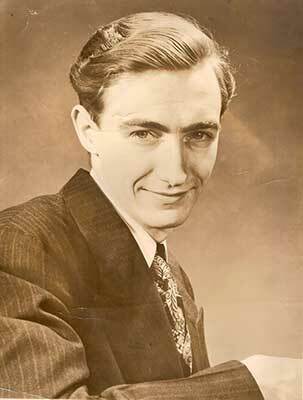 Because of the latter he would frequently remark – “other men say they believe in God; I know!” Dad loved the Church and his country, and he passed that on to his sons. He also loved his French-Canadian heritage, and here under the sunny Southern California skies told me the weird tales of our far-off homeland – of the loup-garou, the lutin, the feux-follet, and all the rest, and sang me such songs as Un Canadien Errant, Au Claire de la Lune, and A la Claire Fontaine. Moreover, he had a sense of style, which I have inherited. 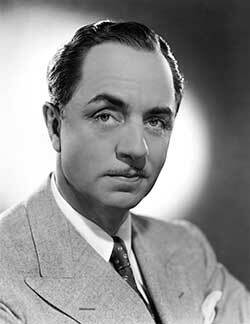 His own father (who died when Dad was six) had always reminded him of the actor William Powell. Well, Dad took after his father in that regard, as far as I am concerned. But in any case, because of the regard in which we held him, everything that was important to Dad was important to us as well. I should not omit the fact that all was not pleasant growing up. Our father’s financial fortunes waxed and waned and waxed again, and Andre and I between us caused him no end of adolescent difficulties. But through it all he kept his sense of humour, and was the first to see the ridiculous in any tension-fraught situation. Dad had no use for Dr. Spock, and believed in corporal punishment; but he used it sparingly, and only after giving us several chances to desist from the offending behaviour. “Never hit your child when you’re angry,” he used to say. So much for the past. What of present-day fathers? Well, you have a hard row to hoe, to be sure. As mentioned, your role is constantly downgraded (a process perhaps first visible in the bumbling fathers of the Leave it to Beaver era), and your gender regarded as a dangerous threat to humanity – at least if you persist in it as one of the cisgendered. You may already be feeling like a failure – especially if your kids share more of the media’s values than yours. It is also quite possible that you yourself were raised without a father. What to do? If you are as yet unmarried, the first thing is to find a wife who shares your values. You’ll need to present as united a front as possible – and there is nothing kids so quickly pick up on as dissent between their parents – they almost automatically use it to what they believe is their advantage. Paradoxically, arguing in front of the children, while offering them opportunities also weakens their sense of security. While some things are pure economics –being prepared to do anything to keep them fed, for example, many if not most are not. No two children are the same, and while you have to show them equality in love, they must be dealt with according to their own natures. Above all, strive to be the kind of father you would have wanted for yourself. Ideally –as my brother and me feel with our Dad – you must be not their buddy but their hero. If your experience of fatherhood is already advanced, take stock of what, if anything you can do to improve it. If your job is just about or already over, and your children have strayed far from the religious and moral path you tried to set them, apologise for failing them. When they ask for what, claim that it is your fault they have left the Faith (this is no doubt partly true; but they do have free will, so don’t beat yourself up unduly). It’ll set them back on their haunches, and possibly open up the way for constructive dialogue. But pray, pray, pray for them, above all else – especially to St. Joseph. My Dad loved holidays – carving the pumpkin on Hallowe’en, saying grace over the Thanksgiving turkey, trimming the Christmas Tree and singing carols, ringing in the New Year, delivering Easter baskets, and enjoying fireworks on the Fourth of July. But Father’s Day, as I say, received little mention – there was no need: everyday was Father’s Day in our house. In that spirit, then, and whatever state your relationship with your children may be in at the moment, let me say that all of you who are trying to your duty as Dad’s in this environment are heroes. May your loved ones shower you this Sunday with pipes and tobacco, pajamas, cigars, bath robes, toiletries, or your favourite books. From the bottom of my heart, I wish you a very happy Father’s Day!